I've recently set myself a little project of 'collecting' as many of the surviving bee boles in Kendal as I could find, and that were easily photographed. All in all I think I've done pretty well. I think a couple have probably been removed or built over, and another is on private property and the owners never got back to me with permission to photograph their boles. So....here are the latest that I've managed to bag. This tiny collection of boles, consists of four recesses set about a foot apart. I've seen photos of them when the undergrowth had been cleared away and they are in remarkably good condition. However, the small patch of land on which they are built is now over grown and they're very difficult to photograph....as you can see. It's thought that these boles may have been built in the early 1800s. They're not readily visible and a little climbing was necessary to catch these photos. This bole is huge, probably standing to four feet high. There is a small shelf in the rear that may have been used to hold the skep during the winter months. The bole is built into the retaining wall that is built into the foot of Castle Garths, and has probably undergone significant consolidation works, as its entry in the IBRA Bee Boles Register states that its condition was 'fair', but looking at this recent photo, its fair to say its in excellent condition now. This bole probably dates from the mid to late 1800s, and is said to have been one of a number of bee boles in this area. Others are said to have been existed in the grounds of the nearby Brewery. When the old Renault garage was demolished to make way for new buildings, the structures shown below were exposed in the rear wall of the land to rear of the garage. At first it was thought they may have been the remains of small iron forges, and that there could have been a smithy here....but with my collection of bee boles growing I thought that these could perhaps been boles, bricked up when the housed here were demolised in the early 1900s. After a little digging about and searching through some old maps, I finally found some features on the 1911 Ordnance Survey map of Kendal. These two features are in the right location for the two arches unearthed when the garage was demolished in December 2006.....and on top of this, the map indicates that there was a smithy in this location. The mystery of these two structures seems to have been solved. Above. 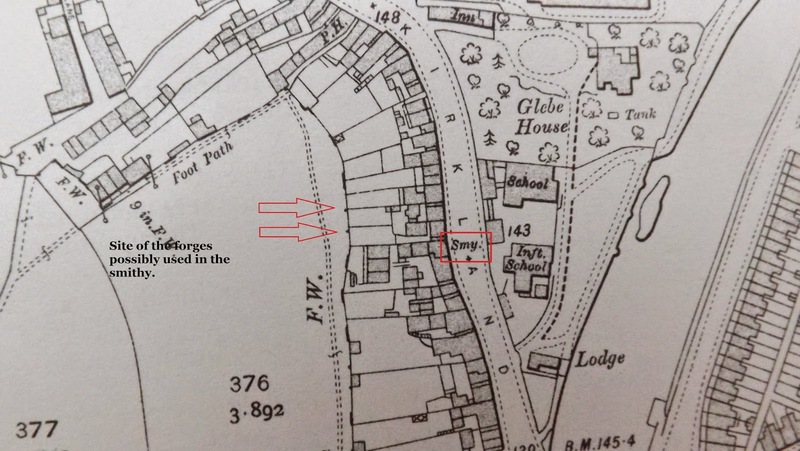 Portion of the 1911 Ordnance Survey map of Kendal, showing Kirkland and the location of the smithy and it's forges. Whilst waiting for the culinary delight that is a McDonalds burger, I noticed the small arch bricked up between the two black bollards. I'm taking a wild guess that this area may have been the back garden or yard of Stricklandgate House, which would have made it the ideal place for a set of bee boles. There is no mention of this structure anywhere, and its inclusion here is pure guess work. The IBRA Bee Boles Register is your first stop for searching for these intriguing structures, but don't be disappointed, many of them are on private property and may not be visible. I suspect the blocked up archway in Stricklandgate House car park was an entrance to a cellar or undercroft. The wall pictured would have been the wall of a now demolished row of cottages that ran alongside Library Road from what was at one time Quiggins shop on the corner on the higher public car park. There was another row of buildings, also demolished, behind Spurretts on the other side of the yard which entered Stricklandgate between the two shops.